February 7, 2014 by Ecommerce News. About Statistics with tags Albania, Belarus, Bosnia & Herzegovina, Bulgaria, Macedonia, Moldova, Montenegro, Romania, Russia, Serbia, Ukraine. 6898 views. The ecommerce market of Eastern Europe may be the smallest of the four European regions, it has seen in fact the biggest growth in terms of percentage. Because with an average growth rate of 35.7% over the year 2012, this ecommerce market was the strongest growing region in Europe that year. It’s estimated Eastern Europe generated an online turnover of 19.3 billion euros in 2013. That’s not very much compared to the other regions, but taken the fact ecommerce in Eastern Europe is growing fast, there’s a lot of ground to gain. Also if you take in mind that only 27 of 106 million internet users in this region are ordering goods online. These data is coming from a report from Ecommerce Europe. According to this report Eastern Europe consists of the following countries: Russia, Ukraine, Romania, Bulgaria, Albania, Moldova, Belarus, Bosnia & Herzegovina, Montenegro, FYR Macedonia and Serbia. The first three countries are also the three largest ecommerce markets in this region. Russia achieved an ecommerce turnover of 10.3 billion euros, while Ukraine en Romania respectively had an online turnover of 1.2 and 0.8 billon euros. 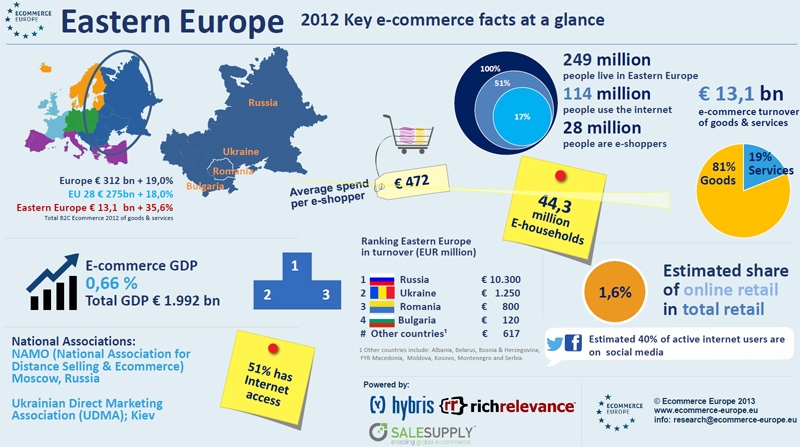 Together all these countries make up for 7% of Europe’s total ecommerce turnover in 2012. We’ve written a few times about Russia, and we just can’t deny it’s an interesting country in terms of ecommerce. It has the largest single market of Europe and it also has the largest online population with 68 million internet users and 20 million online consumers. 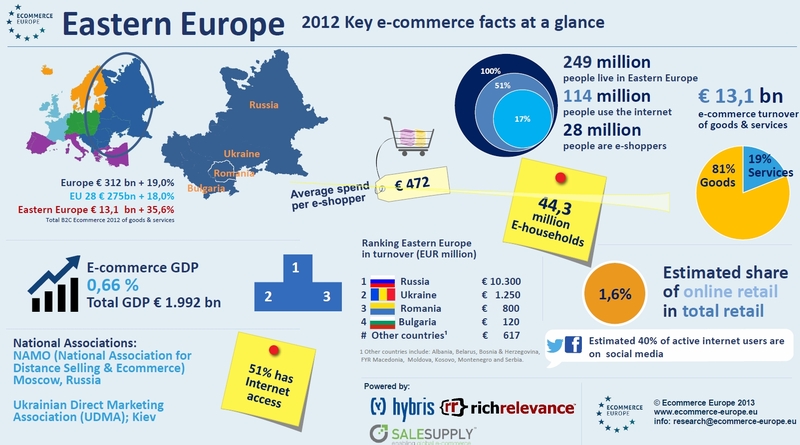 Russia represents more than a third of the total ecommerce market in Eastern Europe. The average Russian online shopper spent €515 in 2012, while the Ukrainians spent €510 and the Romanians paid €400 on average. But despite of all the positive stats about Russia, the Ukrainian ecommerce market outperform its bigger neighbor in terms of average growth. Russia grew with 35.% in 2012, Romania grew with 33.3%, but Ukraine managed to grow with 47% in that year! But Romania, however is the country with the biggest internet penetration: 54% against the 51% of Bulgaria and the 50% of both Russia and Ukraine. Read also our articles Southern European ecommerce to grow to €39,5bln, Western European ecommerce to grow to €174bln and Northern European ecommerce to grow to €31bln. More about Albania, Belarus, Bosnia & Herzegovina, Bulgaria, Macedonia, Moldova, Montenegro, Romania, Russia, Serbia or Ukraine.